“Purple Mountain Majesties” is a line from the song America the Beautiful, which most kids in the US learn to sing in school … so when I read that the Rainbow Scraps Challenge color for August was grayish purple with mountains as the inspiration, the association to this block stuck. In August, we will be making Split 9-Patch blocks in combinations of white and purple and/or gray. 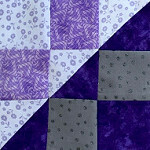 Use the coupon code IUGZKKBPNM to get the pattern free during the first 10 days of the month of August. 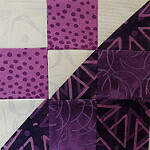 The pattern includes 10 ideas for quilt layouts using this block. Light – Any solid white, white-on-white (WOW) print or multicolor print that has a white background and is predominately white. 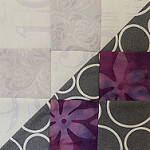 Medium 1 & 2 – Any solid or TOT print that is PURPLE or GRAY. 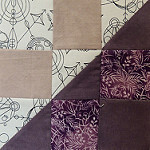 These fabrics should be darker than the Light and lighter than the Dark. 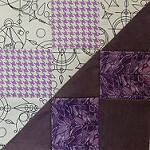 Dark – Any solid or TOT print that is PURPLE or GRAY. 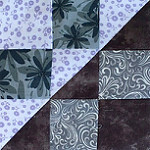 This fabric should be the darkest fabric in your block. 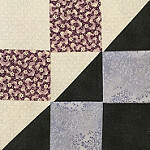 If you make multiple blocks for the Block Lotto, you can use the same fabrics in multiple blocks as long as each 4-fabric combination is unique. 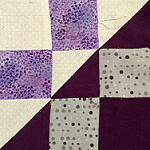 Add the tag S9P to all your blog posts about this block. 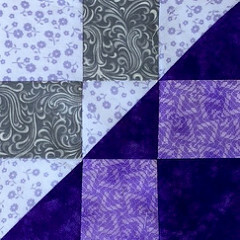 For the Rainbow Scraps Challenge this month, as I mentioned, the inspiration is mountain, combining grayish purple with acid green accents. 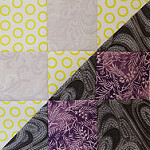 For our lotto blocks, we are using all flavors of purple and gray … acid green could only be included if it was part of your white print. 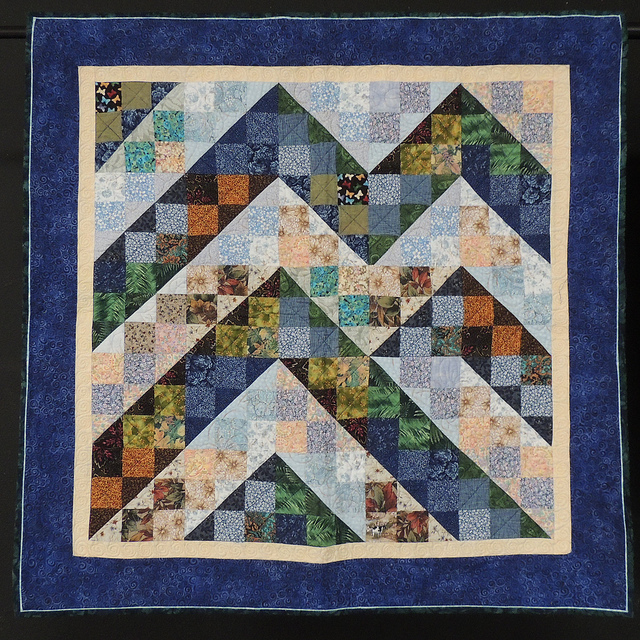 If you are making the Old MacDonald Mystery Sampler (OMMS) quilt, you will need 15 of these blocks in mountain colors of your choice. 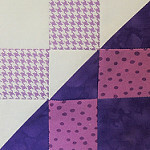 For some of the blocks, you will want to use Summer Sky colors for half the block. I suggest you reserve fabrics for the equivalent of one more block (in Mountain colors) for the future. The 2016 QAL page has been updated with this month’s info and updated layout to include these blocks. 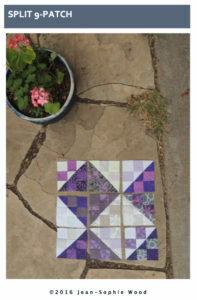 If you are making blocks for the graduated sampler, you’ll need to decide how you will arrange your four blocks to fill a 12-inch square space. 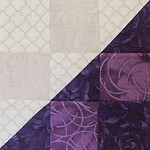 I made this quilt in a workshop some years ago. 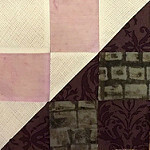 There are 6 different fabrics in each of the Split 9-Patch blocks in this quilt and the block is not constructed using half-square triangles, but each half is created separately and then the halves are sewn together. 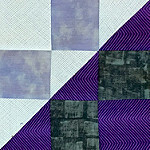 You can find those directions by following the link for the Carolina Byways Quilt. 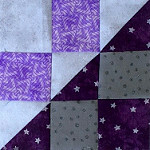 This month’s virtual quilt is made from blocks made by sneak peekers, Barb P, Margaret, Peggy and me. Looks great! 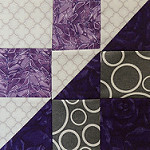 Thanks for another terrific block plan. I hope I get to make some this month!